Normally when people talk about the unemployment rate they are discussing the officially reported unemployment figure. For example the latest figure for July 2012 was 8.3%. Once in a while someone will say something along the lines that if you include discouraged or unemployed workers then the "REAL" unemployment rate is much higher. 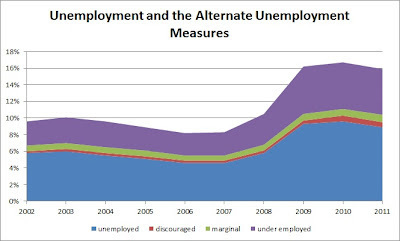 The government does track alternate measures of unemployment that include other groups. In addition to the normal unemployed there are also discouraged workers, workers who are marginally attached to the workforce, and people who are working part time cause thats all they can find. Its not as if these groups didn't exist before we hit the recession. And I don't recall people talking about the alternate measures back in '07 when unemployment was low. Of course I'm not saying that the alternate measures are meaningless or that they should be ignored. But they are just different ways to look at individuals who are either not working for various reasons or who are not working much. In good times and bad there are always going to be a certain % of the population that falls into these various groups for varying reasons. Generally speaking they each get larger during bad economy and shrink when the economy is doing well. There we can find the official unemployment figure as well as the totals including discouraged workers, marginally attached workers and the underemployed. U-3 : Official unemployment rate. This is the normal number we hear reported. The different groups are described as : "Persons marginally attached to the labor force are those who currently are neither working nor looking for work but indicate that they want and are available for a job and have looked for work sometime in the past 12 months. Discouraged workers, a subset of the marginally attached, have given a job-market related reason for not currently looking for work. Persons employed part time for economic reasons are those who want and are available for full-time work but have had to settle for a part-time schedule." So there are quite a few people who are considered discouraged, marginally attached or underemployed in addition to the people who are in the normal unemployed category. I'm going to look at the unadjusted numbers for a few years and pick out the annual rates. I'll subtract the different groups to see how much of the labor force each of them represents. So you can see they grew about the same rate mostly with the exception of the marginally attached group. 2% Drop In Labor Force Participation -- Who Quit Working? The other day DQYDJ discussed how the employment-population ratio has dropped below 59% and hasn't really been going up. The cause of that is a drop in the labor force participation rate as well as the changing unemployment rate. That raised an interesting question in my mind... Why did the labor force participation rate drop 2%? For 30 years between 1988 to 2008 the labor force participation rate was about 66% give or take 0.5%. Between 2008 and 2011 about 2% of the nation dropped out of the labor force. (see chart to right) It was a sharp drop which seems related to the recession. That 2% equates to about 4.5 million people who are not working now versus 2008 after adjusting for population growth. In 2008 there were about 233.7M people in the civilian population over 16 years old and 66% of them were in the labor force. Then in 2011 the population was 239.6M and 64.1% of them were in the labor force. 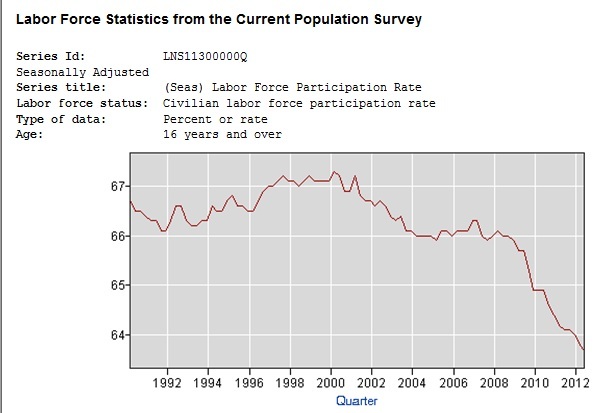 If we still had 66% participation rate in 2011 then that would equate to +4.5M more people in the labor force versus not. Most of this data I discuss today is from the A-1 Employment status historical tables from the BLS. The labor force includes people who are employed as well as those who are unemployed. When you say someone is not participating in the labor force that means they are not employed but they do not wish to be employed or are disgruntled with the labor market enough to not even try to look for work. So if we totally set aside the unemployed people and look at the people who aren't even in the labor force then theres now 4.5 million more people who simply aren't counted in the labor pool. I'm going to discuss various groups of the population and how they contributed to the change in the overall labor force participation rate. The numbers I'm using all come from the BLS. I'm breaking down the total number of people who dropped out of the labor force and the percent this is of the net change in labor force for the total population. These groups do have some overlap so the percentages will overlap some, for example I discuss people age 20-24 and then also discuss college students and theres certainly overlap between those groups. A large chunk of the additional 4.5 million people who don't participate in the labor pool are in the group who are not in the labor force but who DO want a job. In fact there are about 1.3 million more of those people now which accounts for about 29% of the total change in labor force participation. About half of these people have not searched for work for over a year. About 20% of them are 'discouraged' from the job market. 10% are currently not available to work. The other 20% are mixed reasons like illness, helping family, returning to school, etc. Above I discussed 1.3 M people who are not in the labor force yet who want a job. Now you might ask : "if someone wants a job and doesn't have one then doesn't that mean they are unemployed?" Well no. The people who are not in the labor force yet want work are not included in the unemployment figures. If someone stops looking for work for long enough they are dropped out of the unemployment figures and moved out of the labor force. The unemployed portion of the labor force are people who are actively hunting for work on a regular basis. The people who are not counted in the labor force yet who do want work are not actively job hunting. 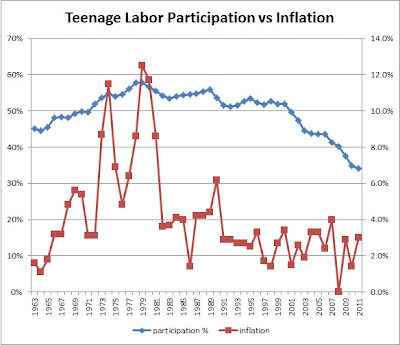 About 18% of the drop in labor force participation is from higher % of teenagers who are not in the labor force. The % of teenagers (age 16-19) who participate in the labor force has been dropping steadily. 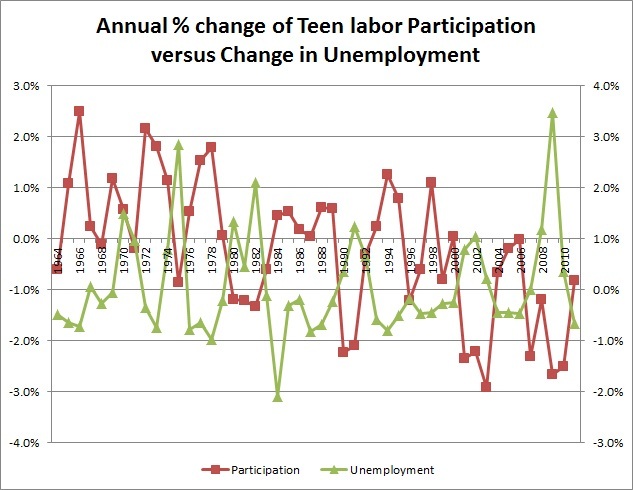 Between 2002 and 2011 their participation rate dropped from 47% to 34%. (pictured at right) Thats a much larger change than the general population. 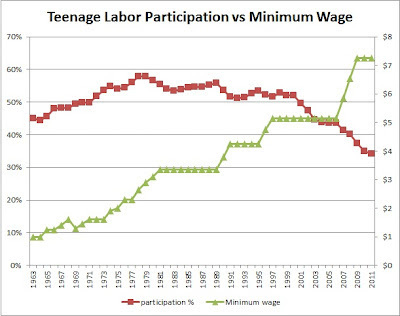 From just 2008 to 2011 the # of non participating teenagers increased 800k. The total labor force dropped from 66% to about 64% and that equates to around 4 million more people who aren't in the labor force. 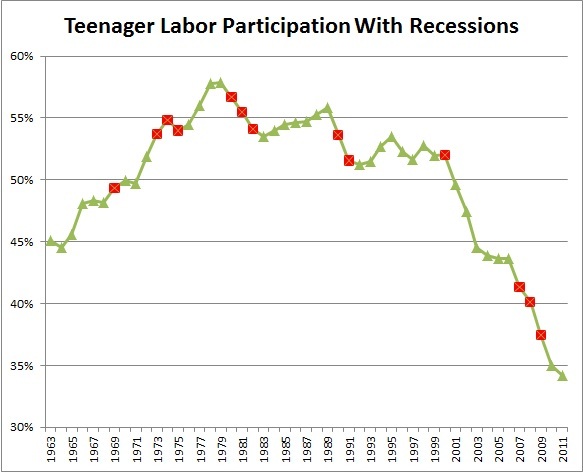 The drop in teenager labor force participation doesn't seem like a reaction to the recession alone. It appears to be a longer term downward trend. If you look at the age group from 20 to 24 years old they also had a steeper drop in their labor force participation rate. 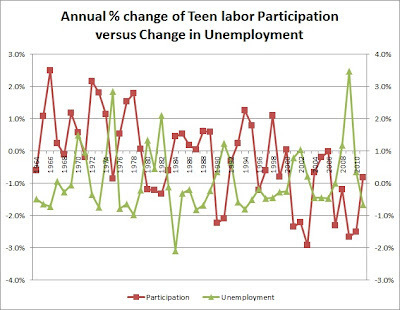 In 2008 their participation rate was 74.4% and by 2011 it was down to 71.3%. Thats a faster drop than the overall population. About 650 thousand more people age 20-24 were not in the labor force in 2011 versus 2008. That 650k amounts to about 15% of the total change. 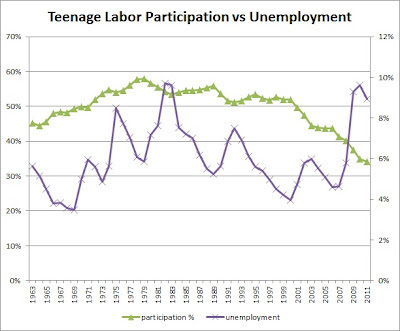 This group had seen decreasing participation in the labor force already. From 2000 to 2008 the participation dropped from 77.7% to 74.3%. SO it was already going down about 0.4% a year. However from 2008 to 2009 it went down 2.7% which is far faster than the existing trend. 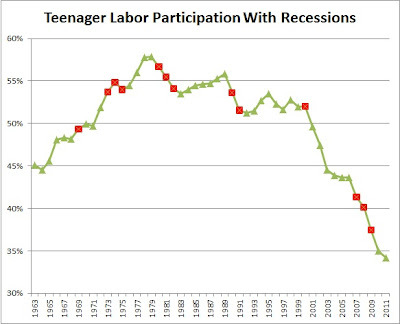 This group quit the labor force partially due to existing trends but mostly due to the recession. I believe a major on this age group is the impact of college enrollment trends. Fewer younger people aged 18-24 are working. We might assume that this could be due to higher college enrollment. 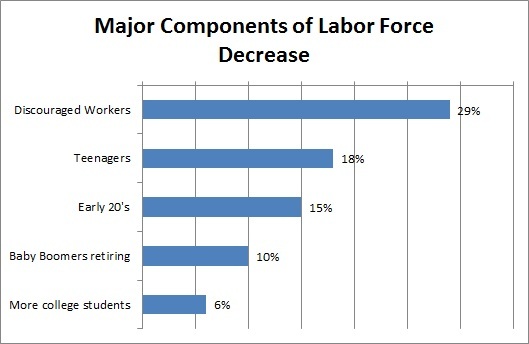 However enrolling in college doesn't necessarily mean you aren't in the labor force. 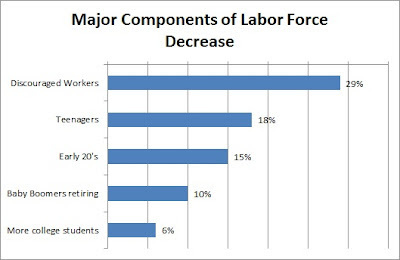 In fact as of 2011 about 39% of the students in college or high school were in the labor force. 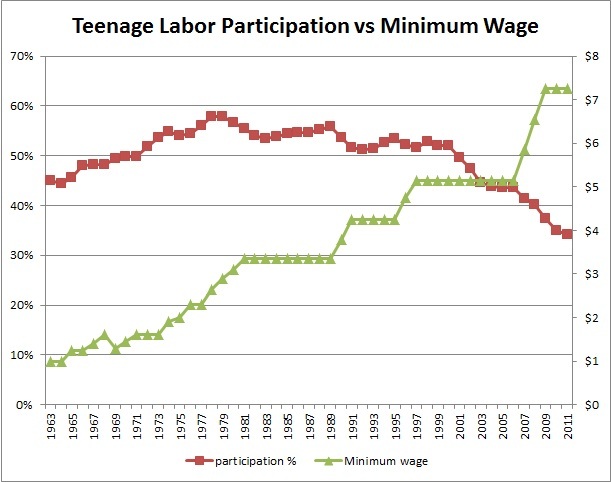 Yet there is a lower labor force participation among college students as compared to people who are not students. If we look at total college enrollment, I find that in 2008 we had about 18.6M students and then by 2010 it had increased to 20.2M. 2010 is the most recent year I could find data. As a % of the population that means we went from 8% of adults in college to 8.5%. This is about 1.1M more students than population growth alone would have caused. Now if we assume that about 40% of those students are in the labor force then this would result in about 288K fewer people in the labor force due to higher college enrollment. This 288k would be around 6% of the total drop of 4.5M in labor force participation rates. From 2008 to 2011 the number of people over age 65 that are in the population increased. When we look at labor force figures this increase is amplified since it excludes the children. Among the population over age 16 the portion who are over age 65 increased from 15.9% in 2008 to 16.6% in 2011. So over those 4 years thats 0.7% more people who are over 65 among the potential labor pool. People over age 65 are usually retired and work at much lower rate than the people age 16 to 64 years. This aging of the population due to the Baby Boomers hitting retirement has contributed to about 0.2% drop in the labor force participation rate. These are the major groups of demographics that I can find data on and try and determine how their individual labor force participation has impacted the entire populations labor force. Again, keep in mind that there is overlap between those groups. I've figured the numbers myself using the BLS data. I also tried in general to account for population growth while doing so. Now lets look at some other demographic factors and how they are or aren't leaving the workforce faster. If you just look at the men over age 16 versus the women over age 16 a much larger number of men dropped out of the work force. For men in 2008 the population was 113M and it went up to 116M in 2011. The percent of men who don't participate in the labor force went from 27% to 29.5%. Thats a total of 3.75M more men who are not in the workforce. If the labor force had stayed steady at the 2008 level then we'd have had about 2.88M more men working based on 2011 population. That 2.88M change is 63% of the total. For women on the other hand the population grew from 120.6M to 123.3M between '08 and '11. In '08 we had 40.5% of women who didn't work which went up to 41.9% by 2011. That is a smaller change then the men. The total number of women who don't work grew by 2.75M. If we held the labor force participation rate steady at 2008 levels then with the 2011 population of women we'd have had 1.69M more women working. That is about 37% of the total. There are different longer term trends in labor force participation for men and women. Men have been on a downward trend over time and from 1990 to 2000 the labor force participation rate dropped from 76.3% to 74.6%. Then from 2000 to 2010 it dropped from 74.6% to 70.8%. For women on the other hand the labor force was growing in the 90's and it went from 57.4% in 1990 to 59.8% in 2000. But then it turned around and dropped to 58.4% by 2010. Both men and women saw a fairly steep drop around 2008-2009. From 1990 to 2007 the rate dropped an average of 0.19% annually for men. With the recession from 2008 to 2011 the rate tripled to an annual drop of about 0.6% a year on average. One theory about a lower labor force rate might be that older people are dropping out of the workforce early. If this were true we'd see a larger spike in the change for people around age 55-64. 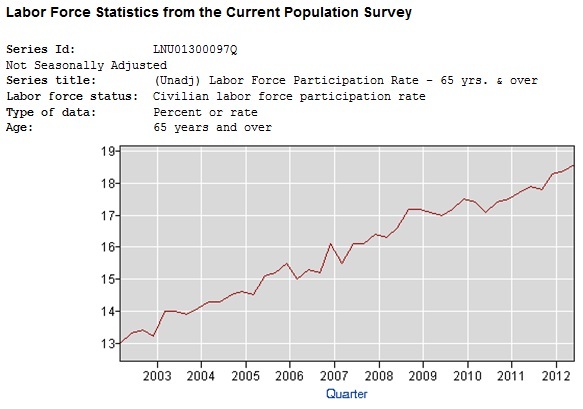 However, there has been little change in the labor participation rate for people 55 to 64 years old from 2008 to 2011. 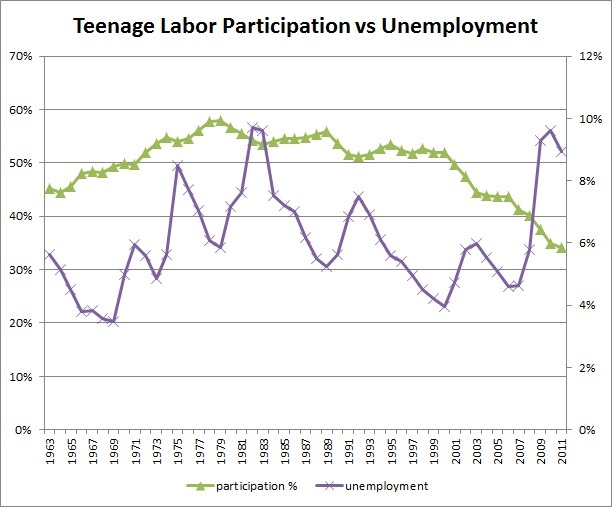 For that age group the labor force participation rate went from 64.5% to 64.3%. Thats much less of a change than the general population group saw so this group actually stayed in the labor force more than other age groups. While some people might be signing on for social security early rather than continue to job hunt, that is not the overall thread and its not adding to the over all drop in labor force. In fact if we look at people age 65 and older their participation rate in the labor force has actually increased by about 1.1% from 2008 to 2011. In 2008 the participation rate for people over 65 was 17.2% and by 2011 it had grown to 18.3%. While you might expect this is due to the recession its actually been a trend for over a decade now. (see graphic at right) In the 1990's the participation rate for people over 65 years old was around 11-12% with a very slight upward trend, then around the year 2000 it hit 13% and has been going up since then. Theres no spike around 2008 during the recession, its just a gradual increase over the decade. This factor actually lessens the impact of the Baby Boomers retiring on the overall labor force participation rate. If Baby Boomers retired at the same rate as they did in 2008 then there would be about 400 thousand more retirees in that age group and the national labor force participation rate would have been about 0.2% lower than it is. One thing I've heard is that more and more people are signing up for disability benefits. That could explain some people dropping out of the labor force. However I don't see strong evidence of this. In fact the BLS data indicates the % of the population with disabilities is down marginally from 2008 to 2011. In 2008 they counted about 26.9M people with disabilities and by 2011 it was at 27.3M. However as a percent of the total population the rate went from 11.50% to 11.41%. But another thing to consider is the labor force participation rate of the disabled population. Most disabled people do not participate in the labor force. The % of disabled people who participate in the labor force was about 23% in 2008 and down to 20.7% in 2011. That 2% change is about the same change we see in the overall population. The total number of disabled people who don't work went up about 470k after figuring for the population growth. That amounts to 10% of the total increase which is proportional to the % of the population that is disabled. The labor rate did not drop due to people switching to disabled status. I'm not going to take any guesses about why the trends differed among education groups. Part of it is probably due to demographics. Bottom Line : There are a variety of reasons that the labor force participation has dropped since the recession. While it may be tempting to attribute it to particular factors like aging Baby Boomers or discouraged workers, its actually a combination of several varying as well as continuation of existing trends. 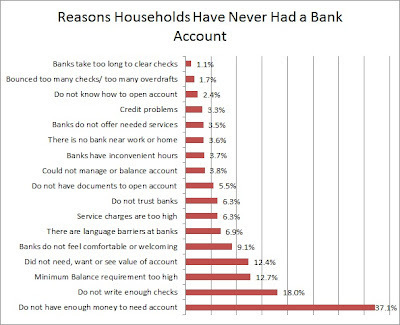 Personally I think personal finance bloggers tend to criticize owning 'stuff' far too much. RitHoltz shares Historical US Tax Rates Poster which has the top marginal tax rates for personal income tax, corporate and capital gains from 1916-2011. RetireBy40 who has recently retired asks What does it mean to be retired? If you are a landlord then its likely that you've been asked if you take Section 8. We currently have a rental vacant that we're advertising and we've had three separate people call asking if we take Section 8. My wife and I do not take Section 8. 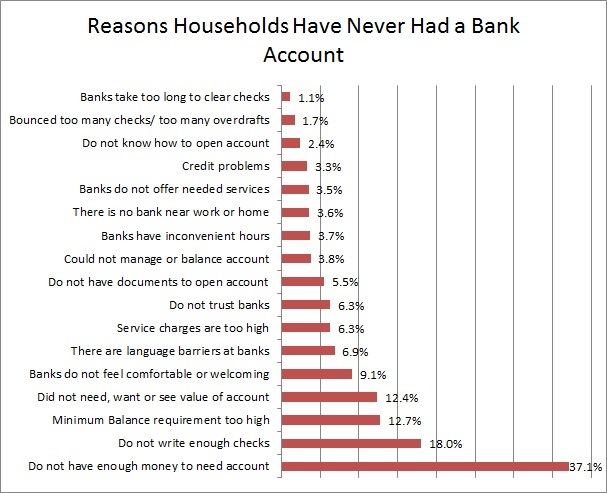 Thus far we've not wanted to deal with "the hassle" of it. But by not taking it we are missing out on an under served portion of the rental market. If you're a landlord then you should know about Section 8 and how it works. Section 8 is a housing voucher program where the government helps subsidize the rent payment for families with low income. The Housing and Urban Development (HUD) department runs the Section 8 program. They call it the Housing Choice Voucher Program Section 8. The system is funded by HUD but administered at the local level by public housing authorities (PHA). Generally the program is set up so that the family will pay up to 30% of their gross household income towards the rent and utilities and then the government will pay the rest of the rent. So for example if a family has $2000 income then they'd pay up to $600 in rent. If fair market rents are $1000 then the government will pay the remaining $400 via the Section 8 voucher. The tenants pick the rental they want independently so they're free to live in any rental that accepts the vouchers. Do you Have to Accept it? Generally landlords are not required to take section 8 vouchers. Federal law does not require landlords to take Section 8. However there are some states or cities that may have laws mandating that you do not discriminate based on such a program and/or simply require that landlords accept Section 8. While in general its not mandatory in most areas, you should check your local laws to see if its optional or not. What does a Landlord have to do? If you do want to take section 8 then theres a few things landlords need to do. First is that the property must pass a HUD inspection. The inspection ensures that the house meets HUD Housing Quality Standards. The inspection checklist doesn't look bad to me and is mostly concerned with basic safety features. They do have particular attention to lead based paint so that could be a issue in older houses. In addition to the inspection the landlord also has to maintain the house in a satisfactory manner. This part shouldn't differ significantly from normal laws that already require you to keep the property safe and habitable but there could be some details that are different. - Cater to a specialized renter audience, there may be more tenants with section 8 vouchers than landlords willing to accept it. - Tenants may be more likely to stay after they find housing that accepts Section 8. - Good rental rates, you can charge the fair market rent which is usually fairly good rent rates. - Have to submit to the government inspection. - Extra scrutiny of your rental by the housing authority. 1. The family applies for and gets Section 8. 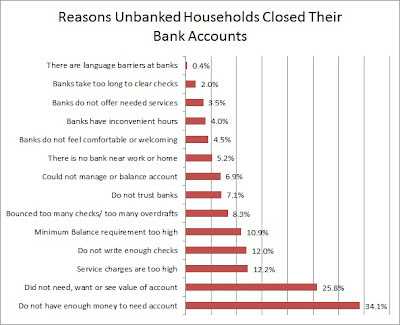 This is usually a difficult thing for the low income family to get and theres usually waiting lists. 2. You rent your property and the tenant finds it. 3. You agree to rent to the tenant and accept their section 8. 4. You and the tenant fill out a government form. 5. You schedule an inspection with the housing authority. They come out and inspect your house. 6. Assuming your house passes inspection and your rent isn't too high then you sign the lease with the tenant. 7. When the tenant is moved in you will get a portion of the rent from the tenant and a portion direct from the housing authority. What the government does and does NOT do. For section 8 housing the government pays a portion of the rent and inspects the housing. Thats mostly it. The government housing authority does not screen tenants and they do not match renters and landlords. As a landlord you will still need to property screen the tenants, check references, etc. You should not assume that just because someone has a section 8 voucher that they are in any way screened by the government as thats not part of the process. This is a topic with a lot of disagreement. Some landlords dislike Section 8 and have a negative stereotype of the type of tenants they get. Other landlords are perfectly happy with Section 8. I'm sure it varies as much as anything and you can get good or bad tenants with Section 8 just like you can get good or bad landlords. I personally would not want to stereotype the tenants nor develop prejudices. And keep in mind that in some areas you are legally banned from discriminating based on Section 8. Thus far electric cars have not been particularly cheap or ultimately practical financially. Chevy Volts cost about $40,000 and the Nissan Leaf is about $35,000. Even with the hefty $7,500 federal tax credit the electric cars have not been especially cheap to buy. When you figure in the savings on fuel the i-MiEV becomes very practical. The TCO cited by Yahoo is just $25,547 for 5 years. They don't seem to say, but I think the TCO figures in the price after the federal tax credit. 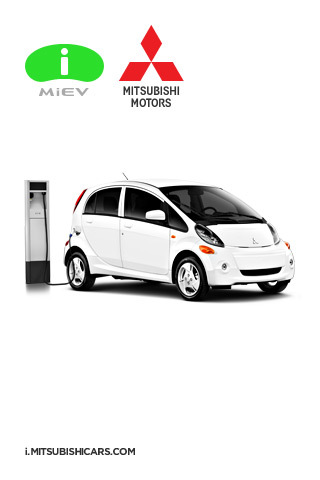 The $25,547 TCO for the Mitsubishi i-MiEV makes it one of the cheapest cars to operate. In fact it might be the cheapest new car on the market in terms of TCO compared to all gasoline, electric and hybrids. I found a list of best TCO cars from Kelly Blue Book. They have the Nissan Versa as the cheapest TCO coming in over $29,000. If anyone knows of a cheaper TCO new car, let me know but I can't find one. Of course you can do better with used cars but I'm trying to compare apples to apples. I like to buy used cars myself and I recommend it as a good frugal tactic. If you wait a few years you might find a good deal on a used electric i-MiEV. But these are brand new models so I can only compare to new to new. In addition to the federal $7500 credit there are also various states that also have more rebates or tax incentives. Some state incentives are minimal like waiving your license fee or emission testing but some states have large credits. Colorado residents are apparently eligible for up to $6000 or $7500 tax credit. Georgia, Illinois, New Jersey, and Utah have state credits ranging from $3000 to $5000. On the down side, I don't think the TCO figures in cost to install a 240V charger. Most people will probably want a 240V charging station in their house if possible. The 120V charger takes about 22 hours to charge the car and the 240V charger takes only 7 hours. The charging station costs about $1000 plus installation. Also, I believe the TCO figure would assume a national average electricity cost of 11-12¢ per kWh. Mitsubishi's FAQ says it will cost about $3.60 to go 100 miles assuming 12¢ per kWh. If your electricity is much more or less then that will impact your costs and the TCO. One of the common complaints or worries about electric cars is the lifespan and replacement cost of the battery. Its reasonable to worry about battery life and costs. But generally with hybrids and electric cars the concerns over battery life is full of misinformation, myth and confusion. The battery in the i-MiEV is backed by a 8 year / 100,000 mile warranty. That means that even if there is a premature problem it will be covered by Mitsubishi. And the fact they are giving such a long warranty is clear evidence that the battery should last. The car is a smaller car and does not have a lot of interior space. It is also limited range vehicle and Mitsubishi claims a range of 62 miles but of course that kind of thing varies depending on use. Edmunds has a full review of the i-MiEV. They say they could only get it up to 82 MPH on the freeway. Thats well above the speed limit but if thats the maximum speed it may be difficult to get it up to freeway speeds. The size and power seem much more suited for city use. This car is clearly not to everyone's tastes and needs, but for a lot of people looking for a practical and cheap car that doesn't guzzle gasoline the i-MiEV may suit your needs. I'm glad to finally see an electric car that is practical financially. I personally like the idea electric cars and hope to see more Americans buying them so we can reduce our dependency on foreign oil. I'm not in the market for a car myself so I won't be buying one. I also have to be honest that I don't know if I'd buy such a small car, but I'd at least consider it as a 2nd commuter car to supplement a full size family car to share between my wife and myself. By using promo code FRIEND12 you can get a free personalized greeting card from Cardstore.com The offer is good til 8/5. Shipping is even free. Sounds like a good deal. I haven't used them yet myself, but this should be a good way to try em out. If you don't have a need for a card right now you can always order a Christmas or birthday card in advance and hang on to it for a few months.